This column is intended to provide messages from the Tarot to address modern problems experienced by everyday people. Questioners, also known as “Querents” submit requests to have their issue addressed in a complimentary three card Tarot Reading, published as part of the Magical Buffet on a monthly basis. The reading not only addresses the Querent’s issue but also provides education about the role of Tarot as a tool for exploration and empowerment. A Querent who will be referred to as “Gwen” to protect her confidentiality, asks for guidance regarding romance. She explains that she is on the verge of making a transition in ending a long term relationship and has hopes for a new budding romance with an individual she has met. She wants to know if this new relationship has potential for long term commitment and although she reports no concern, she wants to know if any indicators of the influence of another woman are shown in the reading. Gwen presents one of the most often requested subjects of a Tarot Reading, relationships. For starters, I am obliged to share a word of caution when it comes to romance and divination. Relationships are a living entity in their own rite. Tarot offers insight into the complex factors influencing the success or challenges in a relationship, but the relationship is also subject to the processes of growth and development of the two individuals involved. Therefore it is useful to consult Tarot to forecast a “pulse” of relationship strengths and challenges, but I would caution against taking the results of the reading as an indication of a steady state that will remain constant “forever”. I say this because any forecast is an indicator of patterns based on the energy emerging now, like a weather forecast. Individuals have free will, and their choices influence the development of the relationship. It is important to use common sense, personal judgment, and intuition in relationship decisions. A relationship that is fulfilling at one time may take more work to maintain connection as individuals deal with stress, changing goals etc. Most importantly, any relationship that begins to develop a pattern of unhealthy interaction such as abuse, violence or control, should be taken at face value regardless of the positive omens appearing in a past prediction. Public Service Announcement aside, let’s proceed to the actual reading. The Aquarian Tarot is used for this reading. Three cards are selected to explore the potential for success in this relationship, potential conflict and long term commitment in this relationship. The selected cards are the Lovers, numbered 6 in the Major Arcana, reversed. Following this card we have the King of Rods, and the King of Cups. 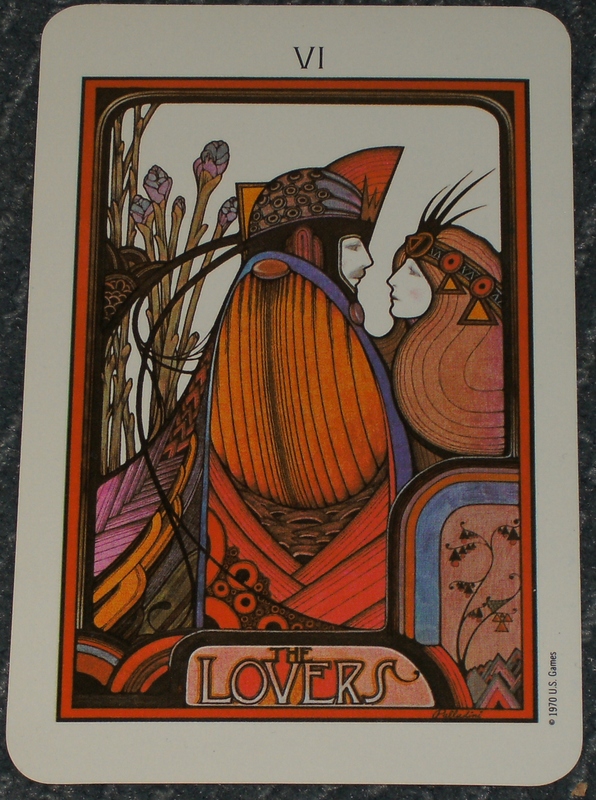 The Lovers card, being part of the Major Arcana, has significant ramifications for relationships of all kinds. It is the archetype of partners and speaks to potential romantic and intimate relationships. Its reversal does not negate its meaning, so do not fear its position being upside down. Gwen faces issues pertaining to her relationship but much more than the qualities of her significant other, her ability to BE in relationship and how this has recently transformed. Gwen has conflicted feelings about her long term relationship that will be ending, and the connection to a new potential partner. The Lovers card indicates focus being brought to relationships, and at this time Gwen would do well to examine the role of cooperation and interdependence in her new relationship. The potential for satisfaction in this new relationship is indicated by this card. As you may guess, there is a “but”…the “but” is the reversal. There is potential for understanding and connection in this relationship, but at this time things are starting off out of balance in some way. Gwen is being given an opportunity to find balance with a partner, but she will have to recognize that at this time there is unequal power. 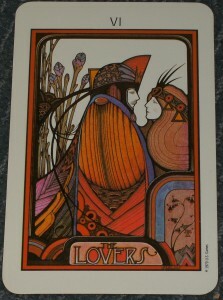 The essence of the Lovers card is the magickal combination of the energies of two individuals, two complete individuals each with their own strengths and weaknesses, who make a harmonious connection which allows them to transcend their limitations, complimenting what one lacks with what another has to offer. The key behind the power of the Lovers is that each partner is independent, but together are a blend of the best each has to offer the other. At its best this relationship is promising. At present, there are some obstacles to overcome, hence the reversal. The Lovers reversed carries an energy of unequal dependency, one of the parties involved needs the other just a little too much. One partner is in a position of giving more than they receive, which tarnishes the sacred balance of the Lovers. It is in fact, a balancing act in any relationship at any time, like a recipe, a dash too much of one ingredient, and there goes the soup! So at present, there is not an equal exchange. This does not mean there cannot be or will never be, but there is not right now. The Lovers is presenting in reverse, to give Gwen the guidance she needs to examine issues of power and dependence in relationships so that she will not repeat patterns of codependency that are carried over from the past. The relationship has potential but issues of expectations around individual identity and independence must be addressed. In the ideal expression of the Lovers it is the admiration and respect for the individual as a separate person that provides for this ideal relationship. When the Lovers are reversed there is a slight twist- control becomes an issue. The partners may have expectations of each other that take away from their mutual independence or identities, the needs of the other become more important than the needs of one’s self. Gwen, take care not to fall into a pattern of rescuing, fixing excessively caring for this person, especially in a way that is unsustainable in the long term. Let it be known from the get go what your needs are as an individual and build the relationship around each of your individual dreams and identities. Do not fear that the relationship will not withstand your boundaries or your needs as an independent individual- it will. It is important to have a reasonable separateness and “interdependence” from the beginning, otherwise the risk of the Lovers reversed is that expectations of caretaking and accommodating will be fostered resulting in a challenging and out of balance role of “provider” or “rescuer” rather than “lover “and “partner”. You are being granted a test of balancing your needs, your partner’s needs, and your relationship’s needs at this time. Knowing the message of the Lovers will help you to pass this test. It will also be important for Gwen to monitor her own insecurities with relationships in general as pain from past relationships may cause Gwen to feel jealous, doubtful of herself etc. and these feelings alone could contribute to behavior that tips the balance in the relationship more in favor of control than trust. Now we have a couple of Kings to deal with. The King of Rods represents where the obstacles, if any, lie in this relationship. He is the master of communication, education, networking and planning, and this is where things need some adjustment at this time. Gwen’s new beau may not always communicate his feelings, and there is no room in this relationship for assumptions. Gwen must be sure to express herself clearly. There is a lot of planning, setting the stage for changes and new beginnings and it is possible for this to bring some stress especially related to very mundane and boring matters such as paperwork, organization, planning etc. The managerial parts of this relationship may be less enticing and perhaps get neglected, but it would be in Gwen’s best interest to be as direct and clear as possible to avoid miscommunications and the problems that go along with “assuming”. Also it is likely that if anyone is going to be a distraction in this relationship, it is not another woman, it is likely the involvement of another man. Whether this is someone who captures Gwen’s attention as this relationship is forming, or represents the past long term relationship that Gwen is ending, this is someone who is potentially intelligent but does not always carry out the plans they make. He may be a lot of talk but lack substance. This is someone who will use words to entice, and even manipulate, and will likely talk a good story- but will be recognized as a salesman, not following up in action what he promises in words. This person is a distraction from Gwen’s relationship. Situations that will challenge Gwen’s relationship will also involve barriers of communication, travel, planning and business- there is some type of advancement in the realm of business that does not occur as planned and puts a damper on plans Gwen and her partner had been discussing and working on together. Gwen should not take guarantees of assistance from others at face value at this time as communication and planning are going to be more a source of stress than resolution at this time. Last but very important, we have the King of Cups. He brings positive indicators for emotional contentment in this relationship and there is a long term commitment potential. This is Gwen’s partner at his best, caring, empathic, sensitive and good natured. Mature and responsive, this shows an emotional connection and romantic bond. This individual takes the relationship seriously and has intentions of committing his emotions to the relationship. What may hold him back or delay him is not another woman, or a lack of deep feelings, it appears more likely to be some type of holdup involving the plans to change direction of business, move or advance in business in some way, particularly due to the offer of an opportunity or assistance that brings some delay, conflict or setback to the end goals. All things considered there is potential for deep connection, understanding, and a strong romantic bond. Some initial caution needs to be taken for both partners to not lose individual identity and independence in the excitement of this budding romance. Best of luck to Gwen in the future, and remember, regardless of where you are reading this, in NYS all readings are conducted for entertainment purposes.